Venue: Australia-China Institute for Arts and Culture Gallery, Room EA.G.03, Building EA, Ground Floor, Parramatta South Campus, Western Sydney University. Corner of James Ruse Drive and Victoria Road, Rydalmere. The group of six Yunnan artist painters and printmakers represented in this exhibition are 杨鹏 (Yang Peng), 王玉辉 (Wang Yuhui), 熊惠明 (Xiong Huiming), 沈德坤 (Shen Dekun), 吕敏 (Lyu Min) and 叶松青 (Ye Songqing). This fine and intensive exhibition from recognized Yunnan artists gives an opportunity to understand the development of an historic and contemporary aspect of art practice post-Cultural Revolution in the context of all contemporary art formations throughout China. The Yunnan movement is particularly interesting as an early, ‘homegrown’, influential art style of many artists born into the Yunnan region with relatively few ‘outsiders’ migrating into the province from the massive Chinese coastal growth of modern mega-metropolis and industry along with a moderate but steady degree of modernization in, for example, the ancient Yunnan city of Dali. As the Cultural Revolution concluded in the late nineteen-seventies, art shifted from government control and influence to an international art market increasingly attracted to China along with a major expansion of artistic styles and themes occurring throughout the country. It is worth noting, as below, an abbreviated time-line of key events in the development of Chinese contemporary art that contextualize Yunnan art styles and themes at important crossover points wherein Western and Chinese cultures blend, and some of these were enough to confuse even specialized audiences, artist and/or curator. Along with Mao’s death the Cultural Revolution drew to a close. The influential first exhibition of art from the West held in post-war China was Landscapes and French peasants: rural life in France in the 19th century 1820-1905 at National Art Museum Beijing and Shanghai. And, that seminal exhibition seeded notions of a critical realism in Chinese realist painting. Twenty-three radical Chinese artists set up their own exhibition of one-hundred and sixty cutting edge artworks as the initial showing of the Star Group. Wu Guanzhong’s first influential solo exhibition held at the China National Art Museum, and his technique hovered, with subtlety, between calligraphy, abstraction and realism, traditional Chinese motifs and western identity, tonal wash and saturated, opaque colour. The groundbreaking ’85 Chinese New Wave Movement was exemplified by the ’85 New Wave Movement at the closure of the Anti-Spiritual Pollution Campaign with avant-garde groups springing up around the country. The Yunnan School of Painting spans the ‘scarring period’ or ‘Scar Painting’ that referenced the emotional wounds of the Cultural Revolution and generated an interest in Rustic Realist painting. Yunnan art retains beauty and the ideal as the emphatic theme of art. As was the case for traditional western art prior to modernism and the shift from realism and narrative to the break out into all of the modernist movements. Particularly since the French artist, Marcel Duchamp, with the major shift in emphasis from beauty and the ideal to wonder and curiosity. The famous pigment-based colourful body paintings and tattoos, as well as tribal clothing, of numerous minorities variously related to the province’s Asian neighbours. Ancient Buddhist cave paintings, discovered within Yunnan and notably the chromatic and opaque-pigment techniques of cave-temple paintings of Dunhuang, along China’s Silk Road. The modern western movement of cubism - reconfiguring renaissance conventions governing perceptions of realism that anticipate perspectival coda - as figure and object are geometrically semi-abstracted into numerous planes spatially and temporally onto a single plane. Thus, rendering a textural sense of ‘feel’ or ‘lived experience’ of depiction greater than a discrete, optical view. Yunnan lacked the metropolitan, industrial and political environment of major cities in the North and East of China, Beijing and Shanghai. Even so, modernization particular to China still carries a remarkable quantum of sentimentality contrary to the West, for whom modernization retains a much cooler, more cynical reformation that would turn and mock the old ways, satirically and often insensitively. You can witness that flush of human feeling for the sentimental in Chinese cinema, for example, within many narrative films of unrequited love. Rather than hyper-industrial urban life Yunnan artists turned to the fascinating and varied ethnicity of their province where, since ancient times, many ethnic groups have co-existed harmoniously; that in itself is a tremendously positive social achievement within an increasingly fragmented modern world. And, it can be said that around twenty-five ethnic minorities continue to live in peaceful co-existence. 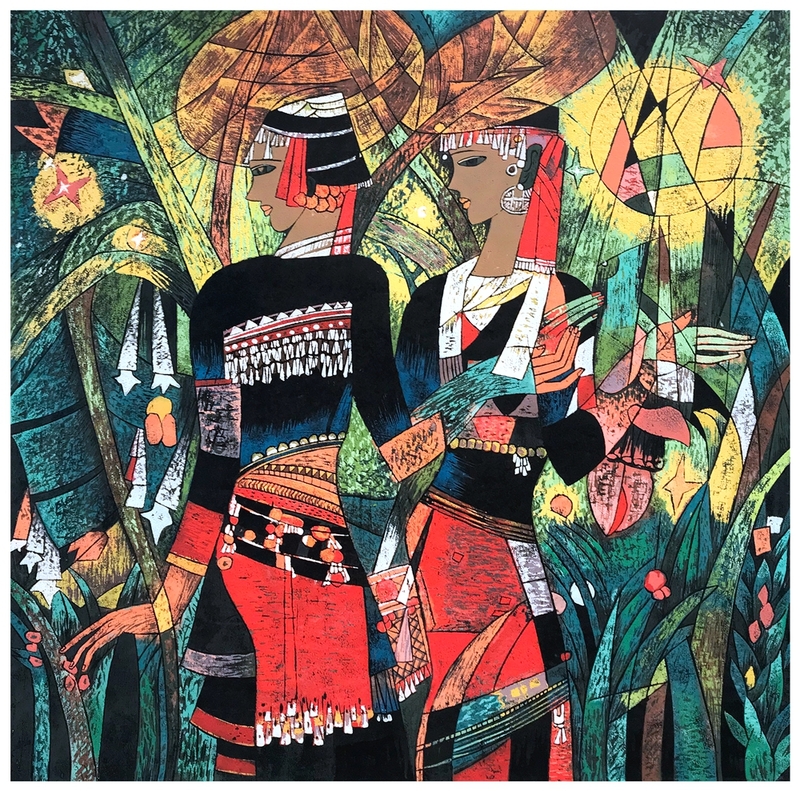 All of this adds up to why the Yunnan is rightfully referred to as ‘rich’, ‘colourful’ and ‘beautiful’ and these epithets very well characterise Yunnan ‘heavy color’ painting worldwide through the latter half of the twentieth century and well into the twenty-first century.